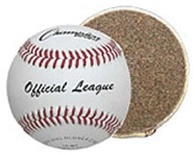 Champion OLBS Official League Baseballs have a syntex leather cover and a rubber/cork core. Ordering a large quantity of baseballs for your team or league? Call us for volume discount pricing.